Explore the business guide to the 2018 High-level Political Forum on Sustainable Development (HLPF) for events relevant to the private sector. 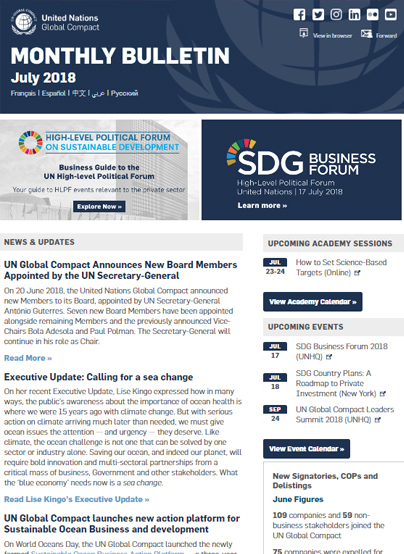 On 17 July, participate in the 2018 SDG Business Forum — held as a side event of the United Nations High-level Political Forum (HLPF), the UN Global Compact, together with ICC and UN DESA, will provide a platform for business to interact in dialogue with other stakeholders, share the private sector’s perspectives and showcase the efforts carried out in support of the 2030 Agenda and the SDGs. On 20 June 2018, the United Nations Global Compact announced new Members to its Board, appointed by UN Secretary-General António Guterres. Seven new Board Members have been appointed alongside remaining Members and the previously announced Vice-Chairs Bola Adesola and Paul Polman. The Secretary-General will continue in his role as Chair. On her recent Executive Update, Lise Kingo expressed how in many ways, the public’s awareness about the importance of ocean health is where we were 15 years ago with climate change. But with serious action on climate arriving much later than needed, we must give ocean issues the attention — and urgency — they deserve. Like climate, the ocean challenge is not one that can be solved by one sector or industry alone. Saving our ocean, and indeed our planet, will require bold innovation and multi-sectoral partnerships from a critical mass of business, Government and other stakeholders. What the ‘blue economy’ needs now is a sea change. On World Oceans Day, the UN Global Compact launched the newly formed Sustainable Ocean Business Action Platform — a three-year global programme bringing together business, civil society, the UN and Governments to advance the ocean economy and sustainable development. The UN Global Compact Academy is designed to give Participants the knowledge and skills they need to meet their sustainability objectives. Delivered through a series of learning sessions taught by world-class experts, the Academy will coach Participants to develop their understanding of critical topics and build actionable skills. The CEO Water Mandate can assist your company in developing, implementing and disclosing your water sustainability policies and practices. Join to share best and emerging practices while forging multi-stakeholder partnerships to address water challenges found in river basins around the world. To advance the positive contribution that business can make to soil health, the UN Global Compact has facilitated the development of the Principles for Sustainable Soil Management through a broad and inclusive multi-stakeholder process involving over 200 experts from business, the UN, civil society and academia working on agriculture, nutrition and food systems. The UN Global Compact Cities Programme is dedicated to the promotion and adoption of the Ten Principles of the UN Global Compact by cities, and provides a framework for translating this principles-based approach into day-to-day urban governance and management. Investing in partnerships can help your business create long-term value and achieve a positive impact on society far beyond what can be accomplished alone. Collaborations can take many forms — within a value chain, across industries, with a local Government or civil society organization, or with the UN. The UN Global Compact helps you find and collaborate together with stakeholders with common interests and comparative advantages. Seeks to provide an in-depth review and includes data on the global baseline status of Goal 6 on Clean Water and Sanitation, the current situation and trends at global and regional levels, and what more needs to be done to achieve this Goal by 2030. Aims to inspire all business — regardless of size, sector or geography — to take leading action in support of the achievement of the Sustainable Development Goals (SDGs). The Blueprint is a tool for any business that is ready to advance its principled approach to SDG action to become a leader. Examines the views of UN leaders, asking agency heads and partnership practitioners across the UN system: what will it take to scale-up partnerships to bring about transformational impact on the SDGs? Offers an overview of the steps businesses can take to help eliminate modern slavery while highlighting key resources, initiatives and engagement opportunities to support business action. Science-based targets provide businesses with a clearly defined pathway to future-proof growth by specifying how much and how quickly they need to reduce their emissions. In this session, experts from the Science Based Targets initiative will help participants understand how to set their company’s target. We will also hear from the private sector on why setting science-based targets is good for business.